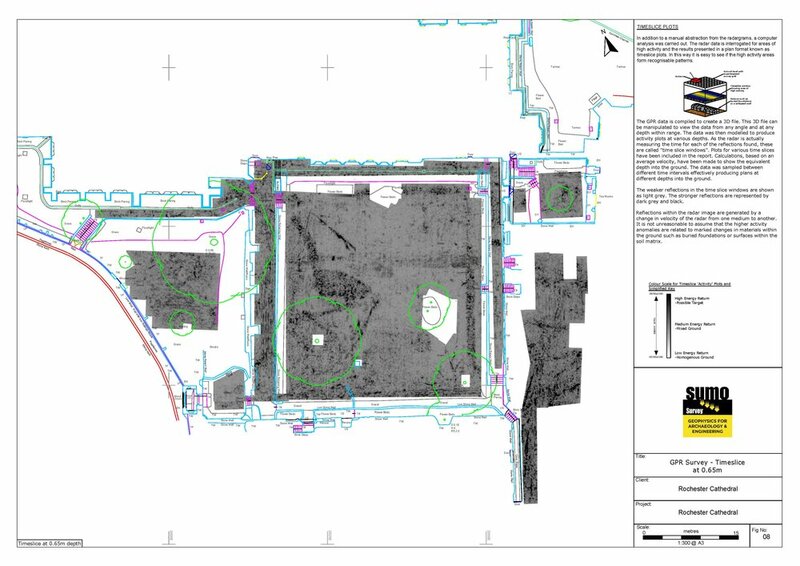 SUMO were asked us to provide as much information as obtainable to the full extent of the Cloister and Chapterhouse, and the possible relationship with the former Roman city wall which defined the south side to the extant Cloister. SUMO carried out a Ground Penetrating Radar (GPR) survey and Laser Scan survey as earlier work at the cathedral had demonstrated how effective the techniques can be in such ecclesiastical environments. The data was analysed using specialist software. In addition to manual abstraction to the radargrams, so-called ‘time slices’ were produced which reveal remains at differing depths below the surface being surveyed. The GPR data fulfilled the client’s requirements and identified a complex of linear and isolated features, probably graves. The potential archaeological remains are probably associated with 11th and 12th century Chapter Houses, early Norman Cloister arrangement, 19th century Prebendal House, medieval buildings and Dormitory range. The remaining responses are modern and include potential services and evidence of tree roots. Two of the main advantages of radar are its ability to give information of depth as well as work through a variety of surfaces, even cluttered environments which normally prevent other geophysical techniques being used.